So… yeah. I’m all about the probiotics. I’m all fermenting and making my own yogurt, and I love me some miso. I guess it was just a matter of time until I got to Kefir. I don’t know why it took me so long. It’s not hard. And according to some of the stuff I’ve been reading, the probiotics that go into Kefir are even better for you than the ones they put in yogurt. Well, maybe. Depending on where they come from. You see, the kefir grains are a lot like sourdough. It’s one of those things that you can’t really buy (although you can), but you can have “passed down” to you. And because these strains have been around for so long, they are really rich and full of different kinds of bacteria. If you’ve never had kefir, the best way to describe it is as a fermented milk drink of about the consistency of drinkable yogourt. It’s not as thick as yogurt, but it has very similar properties. You can drink it as-is, or some producers add blueberry or strawberry puree, for example, to it, to make a kind of strawberry drinkable yogurt. I use mine, simply, in smoothies, or pretty much any other place where you might use yogurt (I’ve even used it in a cake in place of buttermilk). I always put yogurt in my smoothies, as I like the creamy consistency it gives them, and the bonus probiotic. There are basically three steps to making your own kefir. First, you have to get the kefir grains. You can buy them commercially at The Gourmet Warehouse, and probably also Whole Foods, and they also sell more ancient ones at the Homesteader’s Emporium. Probably the best source of kefir grains, though? Craigslist. 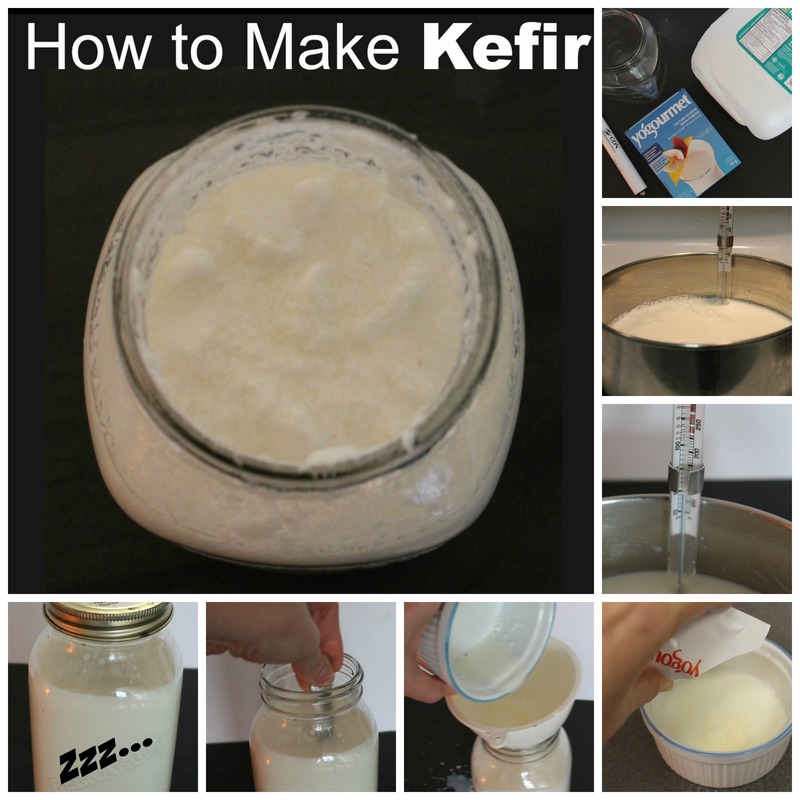 You can get water kefir, for making something similar to kombacha, or you can get milk kefir (which is what I use). Secondly, you heat up your milk, then you let it cool a little. This helps to create the thickened texture of the kefir. Next, you let it sit for 18-24 hours. Now, I’m sure you’re thinking, “waitaminit, lady. You’re telling me to let a milk product sit out, unrefrigerated for 24 hours?” Yep, that’s exactly what I’m saying. The bacteria need a warm environment to do their work. Once it’s completed, you can put your kefir in the fridge to keep for the next week. Heat the milk gently in a saucepan on the stove until it reaches 180 degrees F (82 C). You don’t want it to boil. Take the milk off the heat, and allow to cool down to 75 degrees F (25 C). Take a ladleful of the milk out of the pan, and place it in a small bowl. Add the packet of culture, and mix well. Carefully pour the milk into the mason jar, then pour the small bowl of milk (with culture mixed in) into the mason jar as well. Mix or shake well. Allow the mason jar to sit out, on the countertop, for 18-24 hours, or until your kefir reaches a desired consistency. It should be like a thick yogurt, but still smooth. If it gets too lumpy, you’ve left it out too long. Give the jar a good shake, and then store it in the fridge. Shake prior to each use.